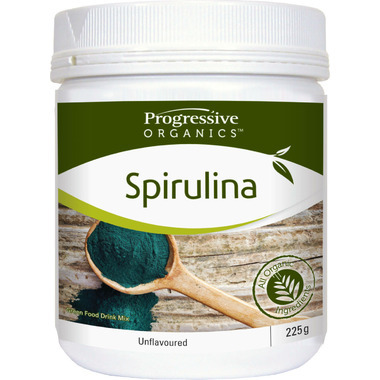 Progressive Organics Aquatic Greens Spirulina supplement is a source of vitamins, minerals and antioxidants. It inhibits the growth of candida and supports energy production and mental alertness. It also promotes cleansing and heavy metal detoxification and supports immune function and energy production. Suggested Use: Mix 1 tsp of Organic Spirulina into fruit juice or the beverage of your choice. Consume once or twice daily. Start with a half tsp and slowly increase to a full tsp as desired. Caution: Consult a healthcare practitioner prior to use if you are pregnant or breastfeeding. Tastes horrible! Will be buying capsules next time..
What is the source of this product? Where is it grown, dried, packaged? Have used this product for about 6weeks now. Have seen a huge improvement in digestive issues. Less gas/bloating! Have only been using for 2 weeks but am feeling more energetic. Better mood.